Ages 10 through 17. 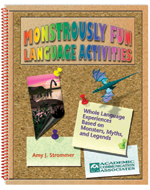 The whole language activities in this volume are designed to stimulate language and thinking skills as children learn about monsters, myths, and legends. Stories about Big Foot, the Abominable Snowman, the Loch Ness Monster, and other creatures are included. The reproducible worksheet activities target vocabulary development, thinking skills, written expression, and other areas. Vocabulary. The vocabulary activities are designed to help students learn the vocabulary contained within the listening passages. Change the Sentence. The student is asked to modify sentences by substituting related words. Correct the Sentence. Sentences are listed that have an error in capitalization, punctuation, or grammar. The student's task is to identify the error and to correct it in the sentence. Fact vs. Opinion. The student is asked to distinguish facts from opinions and to explain his/her answers. Imaginative Questions. Questions related to the topic of discussion are presented that challenge the student to use his or her imagination. Tell a Story. Story starters are listed to encourage students to tell a story related to the theme of the unit.